The United States Naval Academy Cemetery and Columbarium is a cemetery at the United States Naval Academy in Annapolis, Maryland. In 1868 the Naval Academy purchased a sixty-seven acre piece of land called Strawberry Hill as part of their efforts to expand after the American Civil War. Within a year of its acquisition part of the property became the cemetery. Since its beginning the cemetery has become the final resting place for Medal of Honor recipients, Superintendents of the Naval Academy, midshipmen, and former employees of the Academy and hundreds more of the nation's veterans. The cemetery is also home to monuments that do not mark remains, but commemorate the heroism of individuals who gave their life in service to their country. The Jeannette Monument, erected in 1890, is the most notable such monument. It was built in memory of the men who lost their lives in the Jeannette Arctic Expedition. In 1987, the Naval Academy constructed a columbarium adjacent to the cemetery on College Creek. The columbarium was built by the Naval Academy Alumni Association with $500,000 in gifts from alumni and friends of the Academy. This included a major grant from the George and Carol Olmsted Foundation in memory of Jerauld L. Olmsted, Class of 1922. The columbarium offers resting places for those who wish to be inurned at the Naval Academy. The columbarium is approximately 160 feet long and six feet high on a three-tiered pedestal. All exterior surfaces are white marble. Each niche front is removable by a special key. Niches are assigned in consecutive order and cannot be reserved in advance. In front of the columbarium stands a memorial donated by the Class of 1937 in honor of the Academy graduates who died in the line of duty and whose bodies were never recovered. To be buried at the United States Naval Academy Cemetery is an honor, below are the requirements to be eligible for burial, note that Naval Academy graduates must attain a flag rank while on active duty in order to be eligible. Officers, midshipmen, or enlisted persons of the Navy or Marine Corps on active duty at the Naval Academy, Naval Station, Annapolis, or the staff of the Naval Medical Clinic, Annapolis. Those Naval Academy graduates who have served on active duty with the rank of Rear Admiral or Brigadier General, or senior thereto, and such others as the Secretary of the Navy or the Superintendent may designate. Unremarried spouse of an officer or enlisted person of the Navy or Marine Corps who is buried or eligible to be buried in the Naval Academy Cemetery. In the event the spouse remarries, his or her eligibility is automatically terminated. Any officer, former officer, or enlisted person of the Navy or Marine Corps whose spouse is buried in the Naval Academy Cemetery. Stillborn and infant children of the officers or enlisted persons on active duty at the Naval Academy; Naval Station, Annapolis; or Naval Medical Clinic, Annapolis may be buried in a specific lot reserved for such cases. For purposes of this regulation, an infant is considered to be a child who has not reached 7 years of age. Graduates of the Air Force Academy or West Point who cross commissioned to the Navy or Marine Corps and completed 20 years of commissioned service with the rank of Rear Admiral or Brigadier General, or senior thereto. Distinguished Graduates of the Naval Academy. 2. 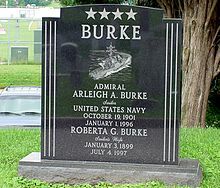 Those eligible to make a reservation for future burial in section 17 of the Naval Academy Cemetery are Naval Academy graduates who have served on active duty with the rank of Rear Admiral or Brigadier General or senior thereto and such others as the Secretary of the Navy or Superintendent may designate. Individual lots in section 17 are not reserved in advance. They are assigned sequentially at the time of need. 3. Nothing in these regulations will change or alter cemetery reservations and commitments made under previous regulations. Wikimedia Commons has media related to United States Naval Academy Cemetery. This page was last edited on 11 November 2018, at 02:53 (UTC).